Apple isn't going to let Microsoft claim that it has the most productive digital assistant without a fight. Siri upstaged Cortana Monday morning, in a digital assistant battle that's just starting to heat up. Microsoft may have positioned Cortana as the future of digital assistants with its surprise LinkedIn purchase, but mere hours later, Apple’s Siri showed off a few productivity tricks of her own that Microsoft is going to have trouble matching. 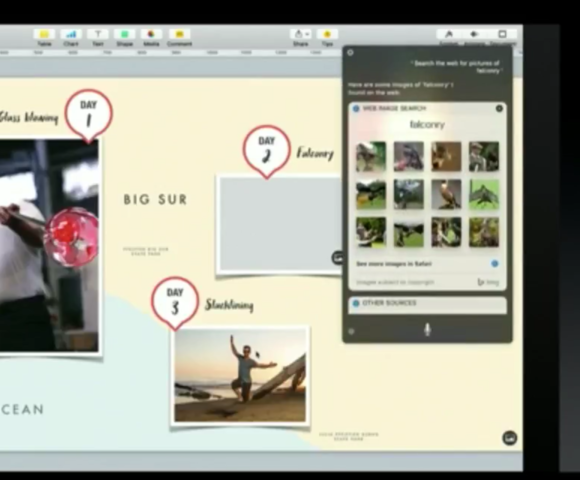 As part of Apple’s Worldwide Developer Conference, Apple executives showed off macOS Sierra, the next iteration of Apple’s Mac operating system. An integrated Siri wil be one of its star features. 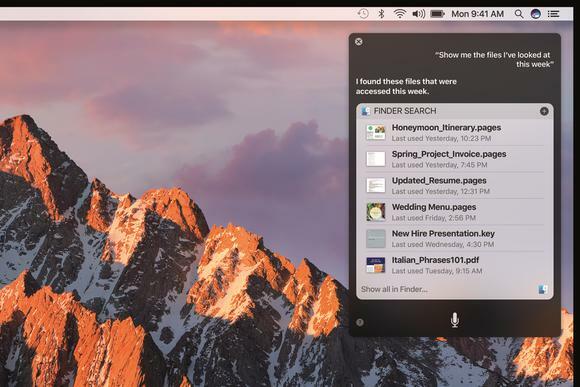 “It’s the same Siri on the Mac that we know and love, but now it can do so much more,’ said Craig Federighi, senior vice president of software engineering, in describing the new Siri. What can Siri do that Cortana can’t...or says it can’t? I used Siri on my own Surface Book, challenging Federighi to bring his best stuff. Unfortunately, he did. Federighi appeared to be tapping a single key when launching Siri on the Mac. Windows users generally require tapping two keys (Win + Q) to launch Cortana. Federighi also didn’t use any active hotwords to launch Siri; on Windows, you can configure Cortana to respond to the active phrase “Hey Cortana” to launch it. Both assistants are equally capable, with a possible edge to Windows. Unfortunately for Cortana, Federighi came out swinging. “Show me the files I worked on last week about the offsite,” he ordered Siri, who did. Siri for the Mac allows you to specifiy attributes that Cortana doesn’t allow, yet. Unfortunately for Cortana, Federighi then pulled out the big guns: “Just the ones that Ken sent me that I tagged with ‘draft’,” he said. I tried my own version: “Just the ones about AMD,” I commanded. Nope, not a chance. I obviously can’t mimic Federighi’s command exactly, as no one named Ken sent me anything to work on. But I feel pretty confident in suggesting that Windows wouldn’t have been able to process this request—though Microsoft’s Anniversary Update may add this feature. For now, however, Siri looks like the winner. Annoyingly, Microsoft’s own Groove Music subscription doesn’t allow you to launch a playlist from Cortana, though you can launch individual songs. In other words, while Federighi was able to say “Play my power ballads playlist” and launch Tom Sawyer from Rush, I had to manually command Cortana to play Europe’s The Final Countdown. A pretty sad substitute, I’d say. Cortana doesn suggest videos, however, which is useful. On the flip side, Cortana does suggest videos by request. 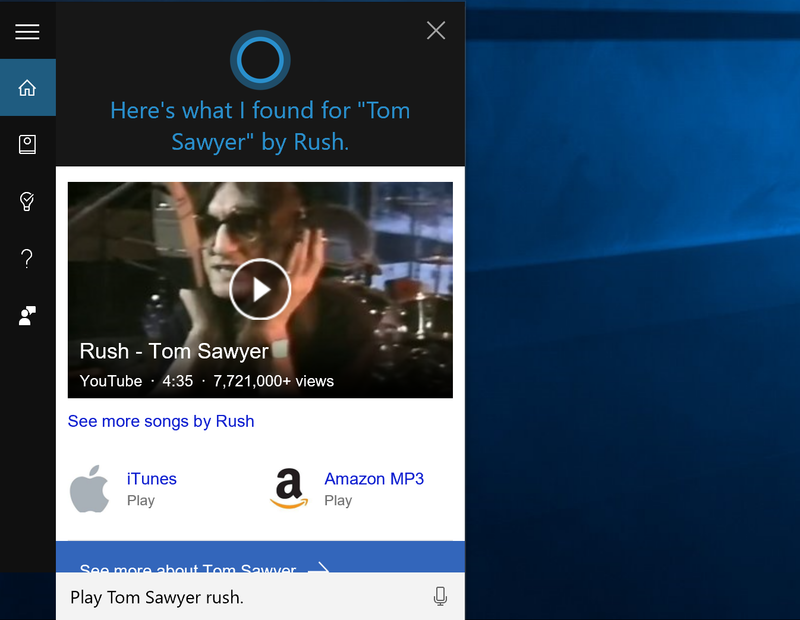 So while I don’t have Tom Sawyer in my music library, Cortana called it up automatically. Cortana’s solution certainly wasn’t as convenient as what Siri offered, however. You'd think this would have been solved by now, right? Federighi then tried “Search the web for images of falconry.” Please: If there’s anything that Cortana and Bing can do, it’s search for images. In fact, you can say that exact phrase into Cortana, and it pulled up images of falcons that I was able to drag right into this story. Problem solved, right? Let’s move on. Siri will allow you to search the Web for images which you can drag and drop into apps. Microsoft doesn’t quite offer the same level of sophistication. Well, no. In Word 2016, if you try to pull the same image in, it adds the link by default. As a workaround, you can click Insert > Online Pictures, which opens up a dialog box, which has a search box where you can finally add a picture of a falcon. 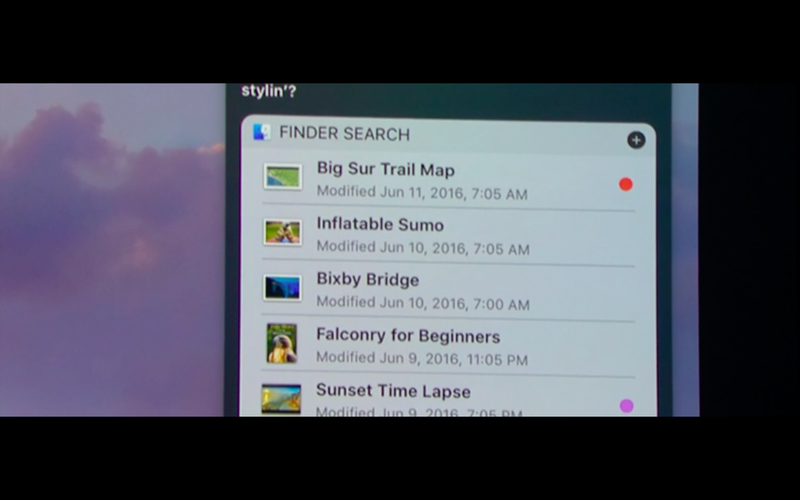 Furthermore, Federighi showed off how you can pin a search to the notifications pane. That doesn’t seem to be possible using Action Center (the notifications pane equivalent) in the current version of Windows 10. 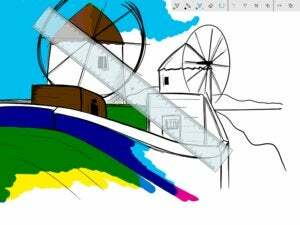 Microsoft Sway, however, is probably the best example of how this could work under the Microsoft environment. You can’t orally order up a picture of a falcon to add to your Sway, but you can add an image and quickly find a Creative Commons-approved picture. That’s something, though Apple still comes out ahead. Oh geez, a universal clipboard? On an iPhone, Federighi clicked Copy. On the Mac, he then clicked Paste. The content copied over. Ugh. 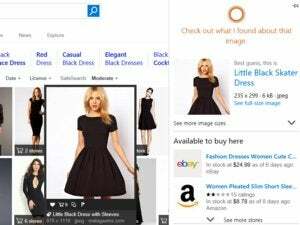 Unfortunately, mobile apps like Microsoft Edge have struggled to share favorites and reading lists, let alone content cut-and-pasted between the mobile and desktop platforms. You certainly can figure out how to move an image between Windows 10 Mobile and the the desktop version of Windows 10 (email, anyone? ), but Federighi made it look so simple. Ha! Here, Windows had no problem keeping up. Cortana will happily tell you which movies are playing near you this Friday. You can also ask Cortana to “tell” a friend or colleague a message, which launches a text on either a Windows phone or Android, provided you have the Cortana app installed. It’s incredibly simple. 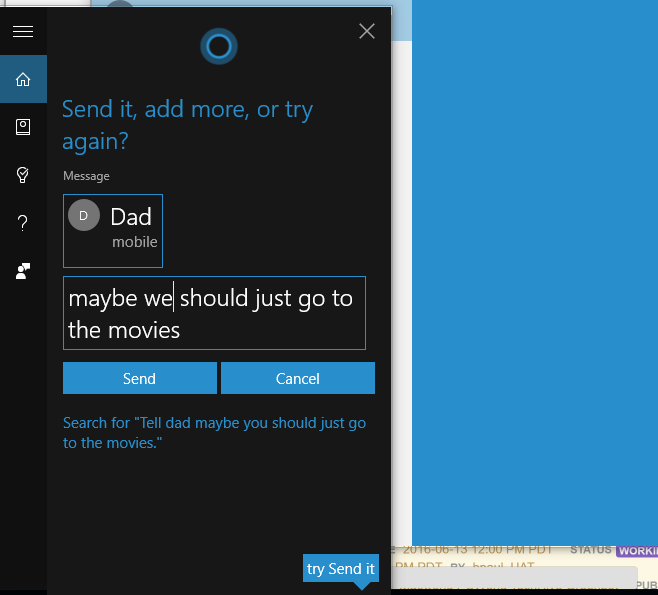 Cortana can handle dictated text messages with aplomb, even when you’re doing something else. Unfortunately, Federighi then wanted to buy tickets to the movie. No problem, right? Well, not really. Not only did Federighi use Apple Pay to buy his tickets, he showed off a nifty little option to pull the movie’s trailer out from a standalone window into a Web page. Eventually, Microsoft should implement tap to pay back into Windows, and Microsoft has already begun implementing biometric security across the web. Honestly, though, are we really hurting for new ways to quickly buy goods and services across the web? Add a credit card to Chrome and it will auto-fill automatically. Cortana clearly fails here, but Windows is open enough that third-party solutions could step in. To be completely fair, Microsoft’s Cortana team is diversifying the digital assistant in ways that Apple can’t even dream of keeping up: hello, Xbox One? LinkedIn? And Apple was showing off Siri's capabilities in demos clearly designed to make it look good. But what has to be embarrassing to the Cortana team is seeing Apple demonstrate core business competencies that Microsoft might have solved years ago. If productivity is Microsoft’s watchword, Microsoft needs to nail these experiences. The problem is that Cortana still doesn’t quite provide a unified experience across Microsoft’s apps and platforms. Cortana has been integrated into Edge, but she still hasn’t really made her way into Office. We expect Apple to top Microsoft in, say, music—but productivity? Gah! Admittedly, we know Microsoft plans to address these shortfalls, but we still have to watch while Apple toots its own horn. And, as a PC fan, it rankles.